Hobbits & Hairdye: Think Pink // feat. Bleach London & Colour Freedom. Think Pink // feat. Bleach London & Colour Freedom. If you follow me on instagram you will have already seen that I have dyed my hair again. In fairness, I did already make it clear that once I'd gone back blonde that it wouldn't be that long before I dyed it again. This time I have gone for my personal favourite: pink. I love pink hair I think it is so stunning, it looks amazing in both bright and pastel shades. I am just obsessed with pink hair so I knew I had to re dye mine pink. I used a mix of colours from two different brands; Bleach London and Colour Freedom. I've used Bleach London before and I am a massive fan. This was the first time I've tried Colour Freedom products and I was pleasantly surprised. The colour is very pigmented, it feels nice on your hair and you get a really reasonable sized bottle of dye. My approach when it comes to hair dye is shove a bunch in a pot and mix it all together until it resembles a colour you like the look of. I love experimenting with colours and every time you top it up you get something a bit different which is really cool. 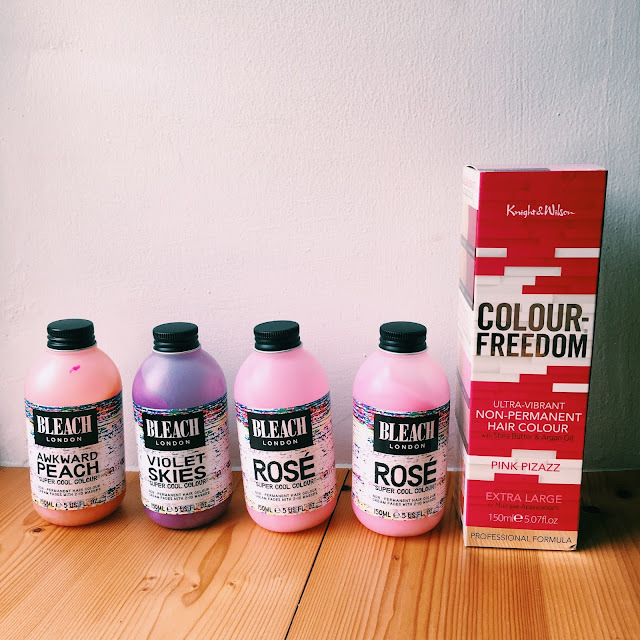 Pink is obviously not the most long lasting colour which is a bit annoying, and these brands are not the most long lasting dyes that I've used but they do last quite a while, I normally have to top it up every couple of weeks. I may look into finding another brand that is a bit longer lasting to mix with these dyes to help keep it pinker for longer. My magic tip is to leave these dyes on for between half an hour and an hour, the packaging says it only needs 10-15 minutes but the longer you leave it the more the hair will soak up they dye, and because they are only vegetable dyes they won't damage your hair like other dyes do when you leave them on longer. I love having pink hair again, it feels very me. I'm so excited to try different variations of colour maybe adding more of the peach to make it more peachy and even giving a more purpley pink a go. There are so many colour possibilities. I would definitely give these colours a go if you are looking to try pink hair for yourself, they are really easy to use and create beautiful colours. What's your go to hair dye brand? What's your favourite hair colour? This is one of the prettiest pink hair colors I've seen, blends lovely with the blond - well done!